Drivers will not be able to pay with cash on the Mass. Pike in 2016, as is the case on the Tobin Bridge. Suzanne deLesdernier has heard all the reasons she should install an E-ZPass in her car. The transponders are free. The tolls are cheaper when they are paid by credit card. She can drive through the booths more quickly without having to stop to hand over cash. But deLesdernier is not the kind of person easily swayed from her principles. Call her a conscientious objector. DeLesdernier is part of a small but stubborn group of Massachusetts drivers who decline to order an E-ZPass, the state’s electronic toll transponder — not because they do not know where to obtain one, or because they do not have a bank account, but because they do not agree with electronic tolling. Some of the reasons for their intransigence include: They are concerned about government surveillance. They are apprehensive about erroneous fees charged automatically to their credit cards. They disapprove of eliminating good jobs held by toll takers for decades. And they would miss the small social exchanges with toll takers, the face-to-face contact, as they pass over their fare. These holdouts are responsible for many of the 26.6 percent of trips made over the Tobin Bridge that are paid without an E-ZPass. Discuss: Do you use E-ZPass? Still, the state’s Department of Transportation is attempting to win them over with free transponders, provided at convenient stops like the permanent shop set up in Saugus’ Square One Mall, or with pop-up kiosks at farmers’ markets and in the parking lots of big-box stores. Their efforts have taken on new urgency since the Tobin Bridge switched to cash-free tolling last month, ushering in a system where drivers without E-ZPass receive a bill at the address linked to their car’s license plate. 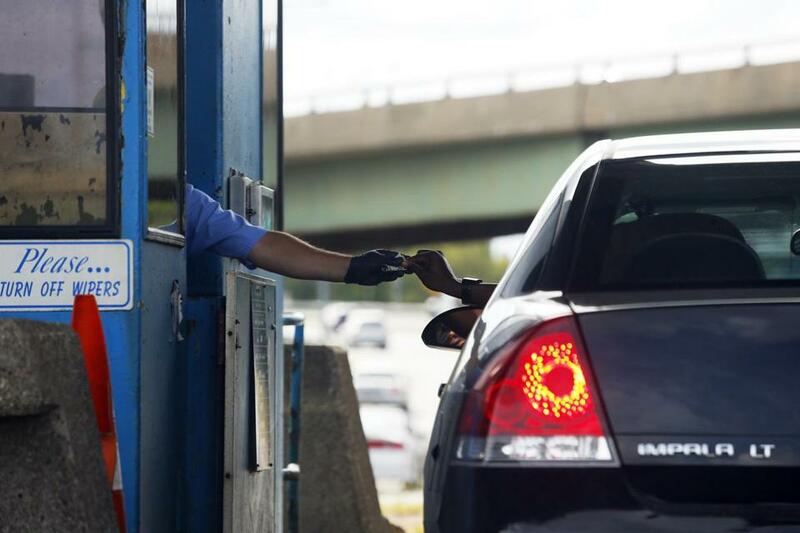 The Massachusetts Turnpike is scheduled to go all-electronic in 2016. For the state’s Department of Transportation, it is an issue of economics: Tracking down drivers’ addresses from their license plates and sending them bills is costly, not to mention the fact that some drivers, especially out-of-staters, fail to pay. The more people who use E-ZPass, the more money the state makes. In some ways, the buzz from the Tobin’s new E-ZPass only policy has been effective: The state received 25,000 requests for transponders in the two weeks after the switch. But not everyone is on board. Many of those boycotting have concerns about privacy. That is the case for deLesdernier, an environmental educator. She is not paranoid about government surveillance — “I’m not one of these people who hides in the woods with guns,” she maintained — but the idea of having a detailed tabulation of her travels feels eerie. Gregory Le Frois, vice chairman for toll services at HNTB Corporation, an engineering consulting firm, said privacy concerns are a common complaint about e-tolling. “A transponder is probably way at the bottom of the list in terms of how available your information is to other people, compared to all the other things you do every day,” he said. Le Frois said transponders will soon come standard in every car — for good reason. Removing tollbooths increases highway capacity, allows traffic to flow freely, and lowers the risk of crashes. Transportation Secretary Richard A. Davey has dismissed the concerns of transponder foes, and reminded them that having E-ZPass will ultimately save them money. But Walker, of the Alliance for Toll-Free Interstates, an organization that lobbies against the introduction of new tolls to the country’s interstate system, said the risks to privacy are very real. “Americans rightly have cause for concern,” Walker said. And, he notes, there are other worries, such as electronic malfunctions and erroneous bills. Julie Swiderski of Framingham gave up E-ZPasses six years ago, she said, because of frequent billing mistakes. Sometimes, she said, her account was charged too much, and she could not get an itemized transaction list to pinpoint errors. She quickly felt comfortable with that decision: No bills, no worries about billing errors, no arduous phone calls with customer service agents. Once she drops the cash in the toll-takers’ hand, she is done. It is a liberating feeling. Besides, she likes the toll-takers. She learned that one was a musician, and he invited her to gigs. She ended up going on a date with another. Occasionally, she brings them coffee. And she certainly does not want to pay to help eliminate their jobs. “I like those guys. They’re cool,” Swiderski said. DeLesdernier agrees. It is comforting to have an extra set of eyes on the road, she said, somebody who can keep watch over an emergency situation on the road or offer directions to a lost traveler. “I think the value of having a human being is incalculable,” deLesdernier said.